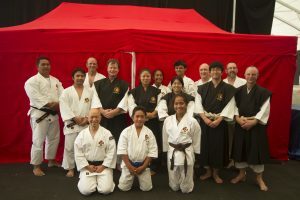 Kenshi from Auckland Central Branch and North Shore Branch were invited to perform an embu demonstration at the 2017 Japan Day festival of Japanese culture held at The Cloud Events Centre, Queens Wharf, Auckland on 26th February 2017. The event is an annual celebration hosted by The Japanese Society of Auckland and the Consulate –General of Japan in Auckland. The event features Japanese martial arts, cuisine, art , music , dance and popular culture . Kenshi from both branches had been preparing embus for about a month prior to the event and it was a great opportunity to show to the Auckland public a wide variety of embus including Dantai ( group embu) , senior men and women performing paired embu and shakujo embu as well as children demonstrating basic techniques. It was good to see a number of minarai kenshi who were prepared to demonstrate Tenchken Dai Ikkai in front of a large crowd. We wanted to show that Shorinji Kempo is a martial art which appeals to men , women and children of all ages. The demonstration was well received and as a result we received enquiries from people who were interested in joining Shorinji Kempo. Steve Young and Takeyuki Morita ( Auckland Central branch ) performing an embu with tanto ( knife) . Manuel Agbayani and Nathaniel Changco ( Auckland Central branch) performing a paired embu. Sean McIlvride ( North Shore branch) and Takeyuki Morita ( Auckland Central branch) demonstrating some basic goho and juho techniques slowly and fast. Rob Burnett , Junior Paepaerei and Sean McIlvride ( North Shore Branch) demonstrating shakujo in single and pair form. Jarrod Moreton and Nick Howdle ( North Shore branch ) kyu kenshi performing a paired embu. Kazuko Noichi and Kanae Atsumi ( Auckland Central branch) performing a paired embu. Minarai kenshi performing a group embu demonstrating basic techniques.